Dale Ulrich is the man behind treadmill training, in fact he is the one that helped develop the infant treadmills that are used to help our little ones walk sooner. He has been known to lend out his treadmills for use to families with children with Down syndrome (hint, hint). If you do any research on the topic, the majority, if not all, of the articles are written by him. In our previous post we covered how treadmill training helps your child with Down syndrome walk sooner. One of the more recent articles looked at the intensity of the workout. He assumed that if the child was on a higher intensity protocol that they would walk earlier. He was right. He looked at 8 milestones and moves forward using pre-walking methods, raises self to standing position, walks sideways/cruises, walks with help, walks alone and walks alone with good coordination; all had meaningful differences (notice I am not using statistically significant as was used in his previous article).Previous studies have shown that with physical therapy alone only 40% of children with Down syndrome walked prior to 2 years, however 94% of his high intensity group walked before 2 years of age when treadmill training was added to their regimen. WOW! His recommendation for increasing intensity on the treadmill was to increase the speed to increase steps per minute. They did other things in this study such as increasing time and putting weight on the child’s legs. The increase in time was the most difficult for parents to adhere to because lets face it we are busy people. The weights took quite some time for the child to adjust to, so he felt that sticking to speed alone would be enough. He increased the speed once a child was able to take 10 steps per minutes, then 20, 30, etc. 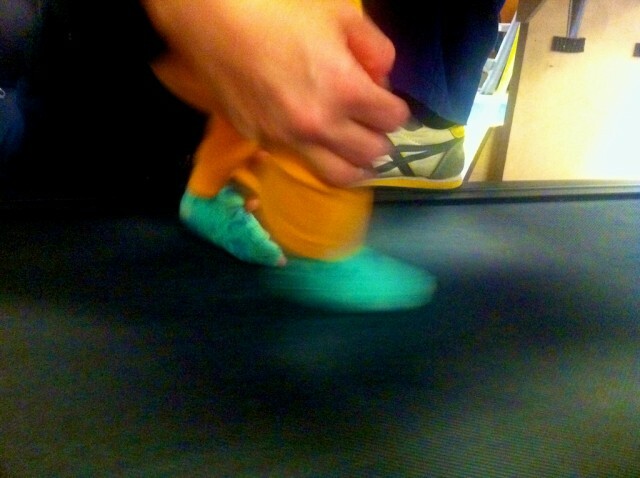 We do recommend your child wear shoes or socks as the belt on regular treadmills is pretty rough. The majority of pictures in Ulrich’s articles have children in socks or barefoot, I don’t know what their treadmills are made of. I think you can also take something else away from this article even if you aren’t doing treadmill training. Our children are able and willing to work hard. We should expect and ask for higher intensity programs for our kids in their therapy sessions. It makes sense in the beginning to not have intense sessions; but if they do not increase your schedule from when the child was a few weeks old to when they are a few months old then you need to do something. Some early intervention programs will try to come as little as possible, so you need to speak up if you feel your little one can handle more. Not only that, but work hard in the sessions. I have tagged along on some visits for early intervention and there is not a lot of intervention going on, just a lot of chatting. We wrote a previous post on options for early intervention programs to make sure you getting the services you need. Noah is nonstop in his sessions. I get tired just watching. I also encourage you to be a hard-core player at home. Don’t focus on therapy moves or working on something, just play. You will be surprised at what your baby will learn. We are going to play and interact with Noah as much as we can, because lets face it, it’s just plain fun. Is anyone brave enough to try their home treadmill (or has your child tried it?) What is your favorite non-therapy playtime activity? Our Great Grandson ( Warren) is a”Down” Guy….. He is six years old now….His mom and dad work with him and have him enrolled in school…. We are so proud of them all…. for all the work and fun they have together…. You just can’t imagine the joy they have brought into our lives…. Thank you for the work you are sharing with everyone…. Thanks! I bet you guys have a ton of fun. How is your great-grandson doing in school? What sort of school is he going to? Public? Private? we have a treadmill at home i wouldve never thought to put jo on there. we are thinking about getting him a walker for christmas im excited to see what he will do with that opportunity. What sort of walkers are you guys looking at? We’ve tried out a few, and I think we found one we really like. I was going to write up a post on it hopefully over the weekend. How old is Jo by the way? Awesome! He is just a few months younger then Noah. We’ve tried several of them (ones we have bought, and ones we’ve used at physical therapy) and it’s frustrating how many of them seem to not be weighted correctly, meaning they tip over easily. Check back over the weekend and by Sunday I should have a top Christmas gifts for children born with Down syndrome under 1 year old post…I’m going to talk about our walker in that post. I love that little Noah is just slightly older than my Corbin (3 months) – I get to watch you guys go through everything first! It’s nice to have some current information to reference as we navigate this new world. Our PT says there are two types of kids with DS – passive observers (who take a bit of time to watch and observe before attempting new things) and those that are “highly motivated” to move. Corbin is HIGHLY motivated and never stops moving! I’m very thankful now that I didn’t sell my treadmill when we moved into our new house! One of the reasons I made this site is because there was nothing else like it on the internet. When Noah was born I searched and searched the net looking for information, facts, videos about Down syndrome. It was the videos I was really interested in. I guess I sort of wanted a ‘window’ into what life was going to be like raising a child born with Down syndrome. Most of the stuff I found wasn’t very positive. I too echo the “great job!” encouragement to you and yours. My son Chase is 21 months old. A year ago I bought a used treadmill off of Craigs List after finding out about the research on line. I contacted the manufacturer to “tweak” the belt speed slower. I have not been as faithful with the training as I would like to brag, but I do think it has helped. Chase at times still resists lowering his feet to the belt, even though he is now a world class cruiser. It has been helpful to hang a toy (i.e. “dangle the carrot”) or have his big bro make funny faces in front of him while doing the treadmill. I like the hang a toy, an have a sibling stand in front of him idea….we may have to try it. By the way, I’m also going to be posting a pretty impressive video that he sent us that shows how effective the treadmill training can be. How are you guys doing now? How Chase doing? Heart, everything else? I’m having fun perusing your blog! What an adorable little boy Noah is, and your birth story was very touching. 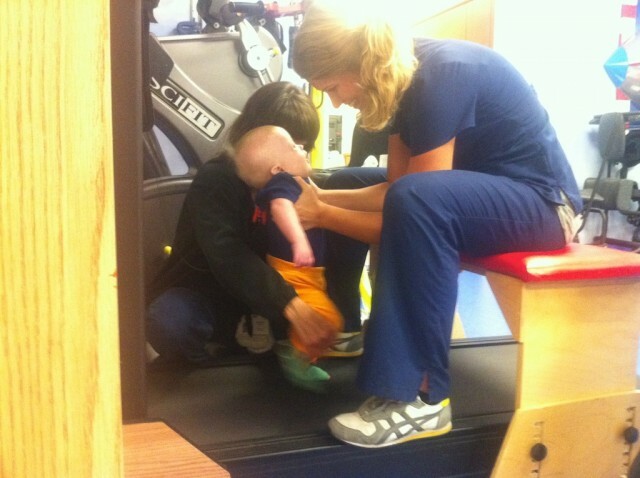 Our PT used a treadmill with Pacey from the time he was about 18 months. He walked unassisted at 21 months and canNOT be stopped these days. It was sometimes hard because it was obviously hard work for Pacey, but he stuck with it and never stopped hanging in there. I’m sad we moved states and had to stop working with that PT…I think he was the single most effective person in Pacey’s Early Intervention! Thanks for your comment, and for telling us about your son! That’s so awesome that he is doing so well! We are behind on our videos (we’ll be catching up soon!) but our little guy is already starting to pull himself up to a full stand! It’s awesome! Mike and I were blessed with Candace – our 6 year old with Trisomey 21 and she also has a 5 year old sister Michelle who is little mother to Candace and it is wonderfull, yet trying at times. However, I am trying my hardest to be stay at home mom and I feel like I fail at everything – being behind on Candaces homework, and let alone house duties and such. How do you do it?? We really also need to work with Candace as she is a little heavy and needs to loose 10 – 15 pounds. Just learned about the treadmill at Michigan University as they trialed DS children and noticed how much sooner the walking ability was happening. Just looking for direction and help. We are so crunched with everything it is not funny. Thanks for your time and look forward to hearing from you. 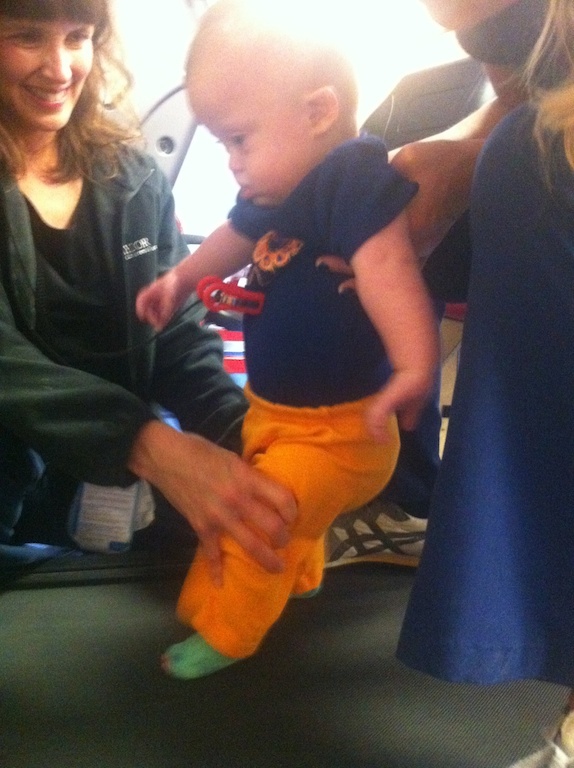 Our Granddaughter, Addison (13 months old) has been doing treadmill therapy for several months. My Daughter rigged a johnny Jump Up over the tread mill and it works great! I have to say Addison prefers to bounce more than she likes to walk on the tread mill, but I do think it is a great therapy. That’s awesome! By the way Addison (a very pretty name) is almost the same age as Noah. (Dec 15). First of all, thank you for your blog. I get so much joy from it, and it really has been an inspiration for my little family… And plus, all the Noah pictures are just awesome! My 13-mo. old was introduced to the treadmill for the first time yesterday. To get the initial feel for the movement, my husband, EI PT and I tried to distract him by putting him in a bouncer that a neighbor had given us. I supported the apparatus on the treadmill, our PT guided Billy’s feet, and my husband held a mirror in front of Billy so that he could look at himself (which he loves to do). It was quite the production, but we all feel that the introduction went well. I’m in the process of hunting down a bench to fit over our treadmill so that we can get Billy’s training going. Now for some silly questions: Did your PT recommend a specific type of shoe for Noah to use while on the treadmill? Do you think there is any way to construct an apparatus like the one Noah during his PT sessions at home? We do not have a specific shoe recommendation. She does prefer ones that have good support around the ankle, which most tennis shoes do. I would be hesitant to build your own harness at home unless you have some pretty crafty people. I will say that we connect to the harness with seat belts connectors. You could probably buy the harness and then build the contraption (we are far from crafty over here so I cannot help you with that one) I have found the Noah does much better when he is held over the treadmill then if he is in the harness, but as you have probably learned it is pretty hard to hold them up that long. It is quite the workout for a parent or therapist. Eventually the child should be taking the majority of the weight as they improve on their walking skills. And thank you for the shoe advice! It’s so nice to have other parents sharing their experiences. My daughter has a different genetic disorder, but the treadmill has been wonderful. It used to crack me up when they put her little body in the harness and move her feet, but she loved it. She is now 8 and walking indepentantly, but they still are using the treadmill in class to build up her running endurance. As for outside “training”, I agree, just play and have fun. When she started walking she really liked to play with stickers, so I made a game that combined them both. I hung up two different colored papers on the wall. I had those colored stickers. I’d give her one and she had to walk and put the sticker on the same colored paper. It was fun and we worked on a few skills at the same time. I am a PT (adult neuro is my specialty) and I have an almost 2 year old with DS. I could not pass up the treadmill training especially after all of the research I had read especially regarding gait quality. I started with the treamill training January 30, 2011 (he was exactly 7 months old) and have done it 5-7 days/week for 8 minutes/day still to this day. I do it now even though the research protocol would have stopped because he has taken independent steps. I don’t regret it for a second, although it was a very big commitment and there were times I felt like I was the one doing the work of holding him up. Now I will look through my journal and video log and really feel like it made difference!